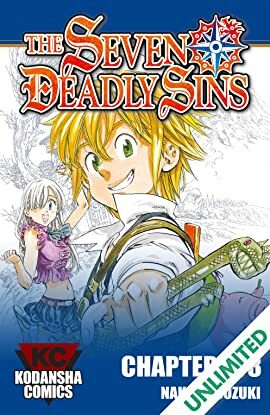 The Seven Deadly Sins Chapter 278: When they were accused of trying to overthrow the monarchy, the feared warriors the Seven Deadly Sins were sent into exile. Princess Elizabeth discovers the truth—the Sins were framed by the king's guard, the Holy Knights—too late to prevent them from assassinating her father and seizing the throne! Now the princess is on the run, seeking the Sins to help her reclaim the kingdom. But the first Sin she meets, Meliodas, is a little innkeeper with a talking pig. He doesn't even have a real sword! Have the legends of the Sins' strength been exaggerated ... ? Prepare to get swept away by an epic fantasy story and colorful cast of characters that will rewrite the history of manga as we know it!